DC and Warner Bros were ambitious and brave enough to launch the DC Extended Universe to tackle the viewership and popularity of the MCU, but since the release of Man of Steel, the DCEU has only faced criticism from the fans, mainly because of the style of storytelling they follow – termed by many fans as abrupt, fast-paced, and simply too dark. Although Wonder Woman turned out to be a true wonder among all the DCEU movies, other releases like BvS, Justice League, Suicide Squad, faired horribly on the box office and received a barrage of negative criticism from fans and critics alike. The disappointment of fans went to such an extent, that some of them started comparing the DCEU with the Arrowverse on The CW and termed the latter to be the better one among the two. The Arrowverse is a shared universe of superhero shows, including Arrow, The Flash, Legends of Tomorrow and Supergirl. This shared universe has been quite a spectacle for fans, who have had a chance to get to know some of their favourite comic book characters up close and personal. Today, we are going to take a look at 10 reasons why fans prefer the Arrowverse over the DCEU, and why such preference is justifiable. Read on to find out more. It is true that movies have a much larger budget than a television show, which makes a considerable difference in terms of profit-earning and what not. But the one thing that movies do not have is time. That is something completely exclusive for a television show. Any show on the Arrowverse, namely Arrow and The Flash, runs for 23or more episodes in each season, each up to 40 to 45 minutes long. That gives each show close to 38 to 50 hours to set up the story, and lead to a proper finale. A two hour or a three-hour long movie has only that much to do everything. Hence, the character development on television shows is much more intriguing. After the failure of Batman v Superman and Justice League, the DCEU has decided to take a look at the Multiverse theory for future films, but, for the benefit of the fans, the Arrowverse has been successfully using the Multiverse for almost 3 years now – a benchmark not easily achievable by DCEU. The Arrowverse has made it a point to regularly introduce new characters from different Earths and has taken the entire Arrowverse cast to other Earths for crossovers. Such use of the Multiverse has kept fans glued to their television screens, and no one expects DCEU to do any better in this aspect. From the onset, DCEU movies have faced one common problem – the lack of a compelling villain. Michael Shannon as Zod was over-dramatic, Jesse Eisenberg as Lex Luthor was just not enough, and Cara Delevingne as Enchantress in Suicide Squad, was a big mistake. But the Arrowverse has always made it a point to provide some of the finest villains in DC comic book history, including Tom Cavanagh’s portrayal of the Reverse Flash, Teddy Sears as Zoom, John Barrowman as Malcom Merlyn, Matt Nable as Ra’s Al Ghul and Casper Crump as Vandal Savage. The villains are not only compelling, but fans are given a peak at their origin stories, character traits, and a clear view of their goals or aims – something the DCEU has miserably failed at. Warner Bros has imposed quite a lot of restrictions on the Arrowverse in terms of character reference, storyline usage, etc. But that has not stopped the Arrowverse creators from adopting some of the finest comic book storylines to have been written. Fans of Arrowverse have had the pleasure of enjoying storylines like CRISIS ON EARTH-X and FLASHPOINT. Most of these storylines have allowed multiple crossovers in Arrowverse, all of which have been spectacular and a grand success. The DCEU, however, has used only bits of comic book storylines, as they have created most of the stories out of thin air. This has not been accepted by comic book fans who want to enjoy quality superhero content. Although the Arrowverse shows run on a limited budget, they have never failed to mesmerise the fans with superhero costumes, which are accurate to the comic books. Fans are introduced to new costumes every season, and they wait eagerly for posts from cast members showcasing the new costume on social media platform. The CW has truly outdone itself when it comes to the superhero costumes. On the other hand, the costumes used on the DCEU have not fared well with the fans. The Flash costume in Justice League was met with tremendous criticism from fans and critics alike. No good story is ever complete without the proper growth of its characters. And this is something that has been a constant problem for the DCEU. The characters were literally forced together in Justice League, without giving reference to any of their origin stories. This is where Arrowverse gains a well-deserved competitive edge. They spend entire seasons developing each and every character of each and every show before bringing the story to a close in the last episode. For example, the Lian Yu flashbacks in Arrow developed Stephen Amell’s character as the Green Arrow in a way no one could have imagined. No matter how much overhyped Warner Bros might have made Justice League, the crossovers on Arrowverse are still better superhero team-ups than the latest entry in the DCEU. 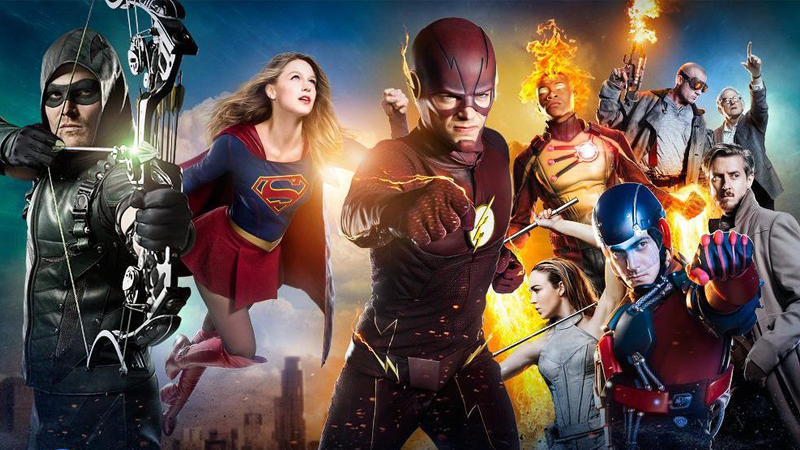 The crossovers are usually mid-season and bring together all the superheroes from all the shows of the Arrowverse. The crossovers have involved fighting alien armies, as well as Nazi doppelgangers from Earth-X – something that the DCEU has failed to accomplish. The CRISIS ON EARTH-X crossover storyline is considered to be one of the finest superhero team-ups on the Arrowverse. DCEU has failed miserably when it comes to focusing on characters for the purpose of storytelling. Each and every movie has been about characters teaming up and taking on bad guy. The Arrowverse, however, is completely focused on and invested in the characters of the story. Arrowverse shows take several seasons to develop a character and tell the story in a detailed manner, so that the fans and viewers can feel connected to the story. This is basically the advantage of having ample time to tell the story. The Arrowverse introduced time travel, as well as many other zanier concepts, in the first season of The Flash. By providing us with a newspaper article from the future that changed in response to alterations in the present and past, introducing Eobard Thawne and teasing the possibility of Barry saving his mom by traveling back in time, the show got us hooked on time travel. Now, Legends of Tomorrow may well be the best Arrowverse show — or at the very least the most fun to watch. The DCEU, on the other hand, is only starting to entertain the idea of time travel. Although, it’s doubtful it will ever play such a major role as it does in the Arrowverse. Casting is one of the essential tasks any live-action adaptation must get right in order to be successful. The DCEU has become notorious for questionable and downright controversial casting decisions. Gal Gadot proved to be the perfect choice for Wonder Woman — despite all the skepticism and contention, but for every Gal Gadot there’s a Jesse Eisenberg. Eisenberg’s portrayal of Lex Luthor was almost universally panned and Cavill’s Superman — although not terrible, isn’t quite what the fans wanted to see. The Arrowverse, however, has managed to cast its shows almost perfectly. Stephen Amell has become synonymous with his character, Grant Gustin set the standard for Barry Allen and Melissa Benoist’s upbeat and seemingly effortless portrayal of Supergirl brings us immense joy. With very few exceptions, the Arrowverse shows nailed the casting.